If you recently fell in love with a pattern, only to realize it calls for knit stitches instead of crochet, don't throw it out just yet. You may be able to re-write the pattern using some knit-to-crochet conversions, creating a similar finished product. Crochet stitches tend to be taller than knit stitches, so be prepared for your project to work up in fewer rows than described by the knit pattern. Make a test swatch to determine which size crochet hook to use; if your knitting pattern gauge says that four stitches and six rows equals 1 square inch of knitted fabric, work up four single crochet using different sized hooks until four stitches equals 1 inch across. Working one single crochet row for every two knit rows will probably be necessary, since knit stitches are small compared to crochet. Work up a test swatch using double crochet if the single crochet swatch came out too stiff; you will probably notice that since double crochet are even higher, your crochet row-to knit-ratio ratio will probably shrink even further. Note your new gauge, for example, single crochet and three rows equals 1 inch, on a piece of paper. Draw a rough sketch of the garment or object you want to crochet, noting as you draw your new measurements, converted for crochet; using the earlier example, for every inch of length on the object account for three rows of crochet and for every inch of width plan on crocheting four single crochet. Write down your new pattern based on your schematics; according to the former example, instead of knitting 60 rows, you'd write your new pattern for 30. 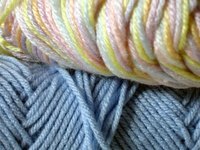 For the best results, purchase a skein of yarn in the same weight as the knitting pattern recommends. Crocheting uses more yarn than knitting, so factor extra yardage for your conversion project. The website Fiber Images recommends adding an extra third of a skein for every skein of yarn mentioned in the knitting pattern.